I love that people care enough about their (our) community to keep on top of the various governmental organizations that impact us. In particular, there’s a group calling themselves Sustainable TamAlmonte who are very active, and to whose newsletter I subscribe. This group recently sent out a letter to TAM (Transportation Authority of Marin) with feedback on a bicycle and pedestrian plan for Shoreline Highway in Tam Junction (see the plan here). I have been thinking a lot about transportation since returning from our trip this summer to Europe, and so I read the group’s feedback with a new eye (I’ll have more to say about that trip in some follow on blog posts). After reading their letter I realized I have a lot to say on the subject — because I use these roads all the time, because I commute by bicycle every day, because I’m a mathematician who understands how queueing theory can help explain where the traffic jams originate, but most of all because I care about this community. Here’s what I wrote. I’m particularly interested in any feedback on the traffic portion of my letter, especially whether or not it clarified the root cause of the morning and evening traffic jams in Tam Junction. Couple of comments about your letter to TAM. In general I agree with you that the traffic situation at Tam Junction is horrible, but I think you’re conflating two issues in your letter – bike safety and traffic congestion – that really should be considered separately. By way of background, I was the one who, 10 years ago, got Charles McGlashan to re-stripe the Rosemont crossing. I also rode with my boys to Tam Valley Elementary school for many years by way of Morning Sun, down Rosemont, and around the corner at the rug shop to Flamingo, until such time as they were able to do it themselves. And, I now bike to work every day by crossing at Almonte by the Tam High field, over to the bike path and on to San Francisco. In other words I am very familiar with this area as both a commuter and a biker. It is my opinion that if done properly, bike lanes will not impact existing traffic adversely. I just drove around the junction a couple of different ways, and there are a couple of places that would require buying or eminent domain’ing some land (e.g. in front of the rug shop), require moving existing sidewalks, and maybe even moving or undergrounding some PGE power poles, but this might not be a bad thing if properly thought through. 1) Right turn lane at the bottom of Rosemont onto Almonte. This is only possible if one moves a PGE power pole, and buys or eminent domain’s some portion of the corner lot. I like the idea, but I’m guessing this is not going to happen because I don’t think it’s a big enough deal, as it only happens for a short while in the morning, and there are alternatives to that left turn. 2) Bike lane in front of the rug shop. This is a must have. I biked many times (100s?) with my kids around this corner and it is quite dangerous, and there’s no good reason why there isn’t a bike lane there. It will require moving the existing sidewalk though. 3) Left turn onto GIbson instead of a bike lane between the new market and the Arco. This is a complete non-starter. I don’t know if you’re a biker, but Gibson is way too steep for kids (and most adults), and after taking a right turn onto Morning Sun that street is way more dangerous than staying on Shoreline, for both kids and adults. I would argue that the proposed bike lane between the market and the Arco would be a good thing, as long as the existing two eastbound lanes remained in place. 5) Bike lane on the short stretch on Shoreline between Proof Lab, past the light, and on towards Tam High. This too is a must have from a safety perspective. Too many kids use this today to pretend that they’re going to go elsewhere. 6) Bike lane striping. 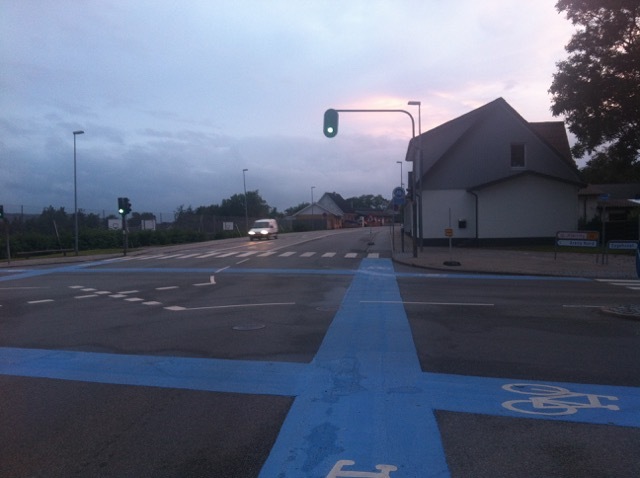 We were just in Denmark this summer and here’s a photo of how they stripe all of their intersections for bike lanes. It would be amazing if we would do something similar with these new bike lanes. Dan, any chance of that? As I said above I agree that traffic in Tam Junction is bad, and could be, with a little bit of tweaking made much much better. If one remembers back 5 or so year ago, there used to be a stop sign at Manzanita (am I remembering back far enough?). When that stop sign was there, traffic would back up terribly all the way to Tam High, just like it does today. Then they put in the light at Manzanita, and wow, the morning traffic disappeared. Why? Because, as queueing theory tells you, when the service rate is greater than the arrival rate, there is never a line. Think about what happened with the Manzanita light…first, 90% of the time there is a green light or green arrow towards 101S, which effectively leaches off 50-60% of the traffic, leaving no more than 40% of the traffic going straight at the light. And when the light turns green there’s always enough time to drain all the waiting traffic (except some times on weekends). Voila, no backup in the mornings. What does that have to do with traffic today? The reason there is traffic today, both in the mornings and the evenings (again the weekends is a different story), is that the lights at TVR effectively reduce the “service rate” (think bank tellers “serving” or “servicing” their customers) to something closer to the stop sign service rate 5 years ago, i.e. before the lights at Manzanita went in. And with that reduced service rate the traffic returned. Think about it. In the morning, southbound Shoreline backs up because the light at TVR is not open long enough to fill up the queue at the Manzanita light. And in the evening, northbound Shoreline backs up onto 101 for the same reason — the light at TVR isn’t open long enough to allow the traffic exiting 101 to get to the two lanes in front of Walgreens and the Arco and queue up there. Basic queueing theory tells us that the new light at TVR is why traffic has gotten worse in Tam Junction, and here’s why. Back before there was a light at TVR, people turning onto TVR had to choose between an unknown wait time, or they could continue around the corner and turn at Walgreens or the Arco. This meant there was typically a very short line turning left onto TVR (because people didn’t want to wait up to 5 minutes to turn). But now they have a known wait time at TVR (which is between 1 and 2 minutes), which means that they know how long they have to wait, and so everyone waits and turns left there, and therefore the light is constantly changing every couple of minutes. What’s the solution? Remove that light so there is no left turn signal onto TVR at any time (you could still turn left, but you’d have to wait for someone to let you in, as before). You could leave the light there to allow people to cross by foot or by bike, but since that happens much less frequently than cars turning left, you’ll have less of a problem. The other thing you’d want to do is to have bikes and walkers wait at least another minute or two longer at high traffic times, so that cars have a better chance to drain past the light southbound in the morning or northbound at night. So there you have it…queueing theory tells us that if we remove the left turn light at TVR, all will be well in Tam Junction. Longer term, if one were really looking to fix the traffic problems in this area, we would be bold and introduce round-abouts at Tam Junction, at Flamingo, and at TVR. 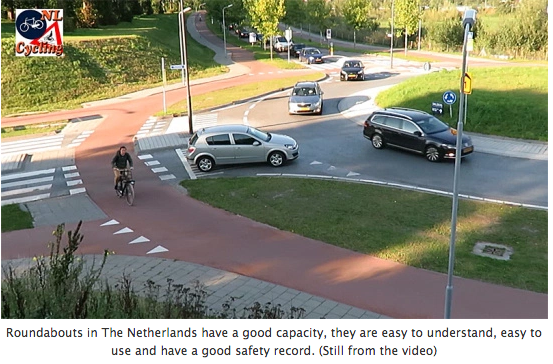 Check out this video of a roundabout in Holland which is, I think, a good example of what could be done at Tam Junction. And here’s an excellent blog post explaining how to make it happen. Maybe TAM should spend some money bringing an expert from Holland over for a consult?